Universal Studios Hollywood is not really a very good destination for small children. Attractions, Rides and themed areas are all fairly limited with the park pitching at an older age group for most of their attractions. The Minion Themed Super Silly Fun land is one attempt to counter this and cater to the younger audience. At the heart of this offering is the Silly Swirly Fun Ride. In our Silly Swirly Fun Ride Review, we found we didn’t really have a lot to say about this pretty basic ride and as such expanded it to cover the Super Silly Fun Land as a whole too. 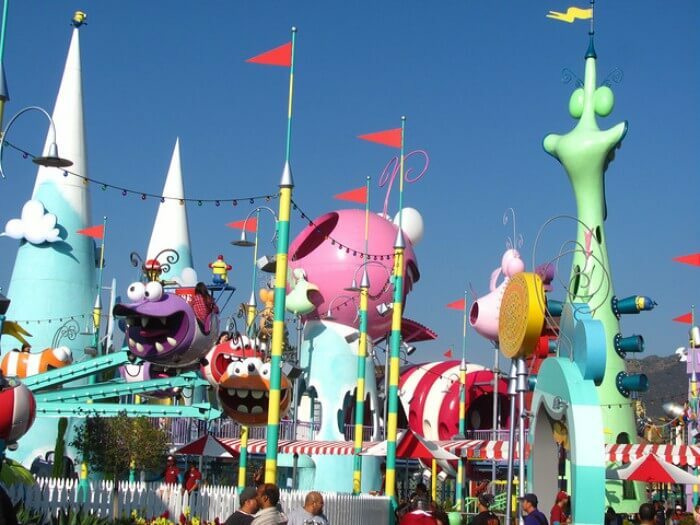 Location – Upper Lot, Super Silly Fun Land, Universal Studios Hollywood. Additional Info – Independent height control. What is the Silly Swirly Fun Ride? This is a pretty basic Carousel. It features individual hydraulic lifts for each car that allows you to control the rise an fall of the vehicle. It’s not exactly new technology and is basically a replica of the flying Dumbo the Elephant Ride that has been at Disneyland for decades (1955). We love Dumbo and while this is basically the same dumbo gets a heap of points as it’s a ride straight out of the ’50s and steeped in nostalgia, a few flying Minion “bee” things are not quite up to that. Very young kids will enjoy the ride but its part of a fairly small roster of kids rides so there better be something else at the park they want to see or do as this ride is pretty poor value for the entry ticket. It’s not a bad ride, its just very basic and an easy option, When you think of some of the fantastic kids rides Disney can come up with, this just feels a touch lazy. What is the Super Silly Fun Land? The Wet zone is the highlight of the zone and is basically a water play area filled with all things splashy. Large Splash zones, water guns fountains waterfalls and jets of water galore. Anything you can think of to get your kids soaked and cooled off. You can lose them for hours in here. Just remember to bring suitable clothing and dry things to change into. Not quite so much fun during the colder months. It’s L.A so it is never cold, cold but in the depths of winter, it’s too cold to play in a splash zone for too long. Even in spring, we tend to avoid the water rides. The Dry zone is a more conventional play area with climbing frames and slides and tunnels. It’s quite small and not the best but might pass a few minutes of their time. Like the Fun Land from the Film there are several Midway Style games where you can shoot Laser (water) cannons, Through Balls and other such things to win real prizes. The games are fairly horrendously priced but the chances of winning are fairly high so your kid should go home with the Unicorn…it just might end up costing $45, their happiness is priceless though, Right? Universal would be seriously missing a trick if they were not dressing people up in Minion costumes and sending them out to mingle with the crowd. Obviously they are not that stupid so you will see a plethora of different Minions out in the areas around the Fun Zone. Along with The kids, Margo Edith and Agnes and Gru himself. There is also a Lab themed Cafe and Treat Stand and a Gift shop as a final way to extract your money. The Gift shop being a great place to finally get that unicorn if you just could coax your kind into winning on the Midway games! Overall taken a full Zone the Super Silly Fun Zone and the Minion Mayhem ride is a really welcome addition to the park and does provide a lot to do for younger kids. Something that was missing, along with the Harry Potters Wizarding world, various Character meets and the Springfield area, Kids are pretty well entertained in the park, It still pitches slightly older audience. Been to the Super Silly Fun Land or Ridden the Silly Swirly Fun Ride? What did you think? Or more importantly, what did your kids think? Was there enough to do for them or were they bored in five minute? Let us know in the comments below and fire away if you have any questions about the Super Silly Fun Zone or the Silly Swirly Fun Ride. 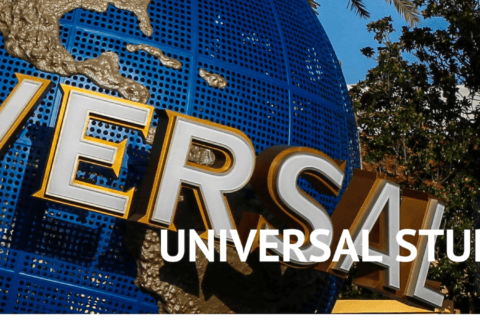 Next Post:The Las Vegas Pass Review 2019 – Is the Las Vegas Pass Any Good?